Rochester, MI – Every child dreams of what he or she will be when they grow up, but how many of those children actually get to experience the magic of a dream come true? Aidyn was diagnosed with Leukemia at only 3 years old. Throughout all of the tests, hospital gowns, and medication, Aidyn dreamed of being a police officer. In 2016, five-year-old Aidyn got to be an honorary Michigan State Trooper for a day. 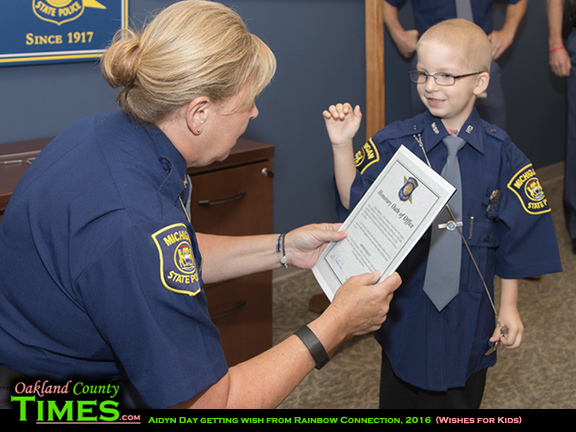 He was sworn in, received a uniform shirt and badge, took a helicopter ride, participated in cadet training, and even took part in a car chase where he was able to arrest the “bad guy.” Most importantly, Aidyn was able to forget about his illness and just enjoy being a kid. Aidyn’s amazing experience was possible because of The Rainbow Connection (TRC). 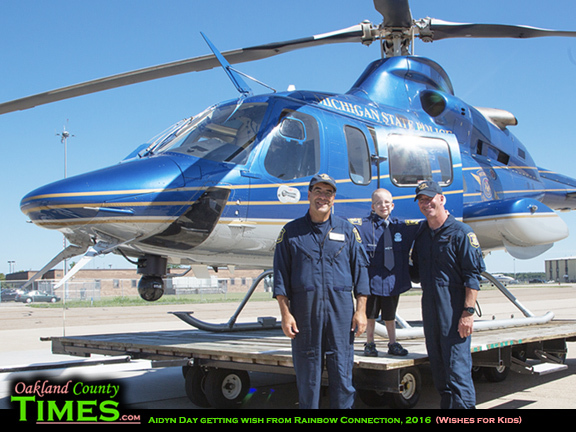 The Rainbow Connection is a 501(c)3 Michigan non-profit dedicated to fulfilling the wishes of children battling life-threatening medical conditions. Since 1985, The Rainbow Connection has granted over 3500 wishes to brave children right here in our community. The Rainbow Connection allows children to dream. It has granted wishes for special family trips to Disney World, the Bahamas, and Alaska, just to name a few. The organization even arranged for a wish child to throw out the first pitch at a Tiger’s game and meet Miguel Cabrera! But The Rainbow Connection is more than just a wish…the support doesn’t end once a wish is granted. The Rainbow Connection has an array of programs that assist children and families beyond their wish. If a family is experiencing financial struggles as a result of their child’s illness, for example, they have a referral program to community agencies that can offer further assistance and, when necessary, can offer emergency financial support. “Many of these families struggle financially during these difficult times. Often the children are so sick that one parent is required to take care of the sick child during long hospital stays and/or treatment regimens. Expenses continue to mount as a two-income family is now supported by only one. This is compounded when it is a single parent household. With its many connections over the years, TRC is well-positioned to connect these families before the wish, during the wish, or even after the wish has occurred, with other human service organizations, utility companies, as well as other entities that help lighten the immediate problem(s),” said Executive Director, George Miller. They also support the children during their treatment with an enhancement program that provides welcome distractions for these brave children like Happy Packs during hospital stays, complimentary sporting and entertainment tickets, and a summer picnic and holiday party. In addition, they offer scholarship opportunities for wish children who pursue higher education. The Rainbow Connection’s dedication to lifelong support of its Wish Children has even inspired former recipients to become donors themselves. Former wish recipient Blake Jackson spearheaded the 2019 Clash for a Cause fundraising hockey tournament, which raised over $16,000 to grant wishes. Nadine Bazzi, a 15-year cancer survivor and former Wish Child, recently raised over $10,000 through a GoFundMe page, which will be used to sponsor two wishes. “The Rainbow Connection was able to make me feel like a little princess and made me forget about all the bad that was going on in my life. Going on this trip made me forget about the cancer. It made me forget about the nurses, the doctors, the needles, the shots and my hair loss. The Rainbow Connection made my wish come true and the memories I made because of them are irreplaceable,” Bazzi said. The Rainbow Connection has consistently received top ratings from Charity Navigator and Guide Star for its fiscal responsibility and transparency. In addition, 86 cents of every dollar raised goes directly to wish services. The Rainbow Connection serves only Michigan families, which means your dollars help children and families right here in your community. Since they began their mission, no child in need of a wish has ever been turned away or made to wait. Their wish is to provide hope, memories, laughter, and a Rainbow in the midst of a family storm. Donors and volunteers are an integral part of The Rainbow Connection family and Wish Director, Ingrid Todt, emphasized they are always eager to welcome those interested in dedicating their time. Call us. Email us. Get Rainbow Connected and help us reach more families with your tax-deductible gift today, come join us as a volunteer, or host a fundraiser! The Rainbow Connection is located at 621 W. University, Rochester, MI 48307 or visit our website at www.rainbowconnection.org.